Halloween baby shower themes – If you are looking for great baby shower ideas and are due in October, why not throw a Halloween baby shower? Halloween is such a great holiday theme to create a party around, as this combines both creativity and some spooky fun. There are so many ideas that can be played around with which will make this a party that will be always remembered. At first thought, combining baby showers and Halloween does not seem like a good fit, with freaky costumes and gory monsters combined with cute and sweet baby showers. However, do not let this put you off as there are a lot of Halloween baby shower themes. These themes include a Little Pumpkin Baby Shower, Mommy’s Little Pumpkin, Baby Brewing, or A Cute Lil’ Monster. Decorations are an important part of throwing a theme party to create ambiance. Depending on the theme of the party, symbolic candy, witches hats, and pumpkins be used. 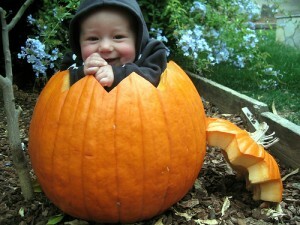 Pumpkin-related themes can dress up a baby pumpkin in a diaper. A small to medium-sized pumpkin can also be cut out and a bouquet of flowers placed in the middle to create a unique centerpiece. Decorations can be placed on the wall such as moons, witches, monster cartoons, and cute baby monsters. A terrifying yet delicious menu can also be prepared. You could serve brewed drinks such as hot cocoa, cider, tea, and coffee and a hearty stew placed in a cauldron. Pumpkin bread and pumpkin cookies go great with this. Food can also be labeled with imaginative and scary names such as witch’s stew, Frankenstein’s franks, Dracula’s blood pudding, magic potion, or fright night drink. For dessert trys a cake decorated with chocolate frosting and licorice to make a spider-shaped cake. For an even more creepy effect, colored whipped cream and softened cream cheese can be used to create the effect of a spider’s guts. Games are always great fun to play at a baby shower. Trivia games about the mom can be played by guests writing down their answers on a decorated piece of paper with ghosts, zombies, and other spooky creatures. A Pumpkin Carve Off can be held, where people are split into groups and they have a specific time to carve their pumpkin into a baby-related theme. Your Halloween-themed baby shower can be as elaborate or as simple as you want it to be. This is a fun celebration of a new birth so it does not have to be too gory, but rather just the fun and silly side of Halloween so guests can get the mom-to-be ready to welcome her new baby into the world. We hope these Halloween baby shower themes and ideas got your mind going and help you to have a scary-cute shower! Another thing to keep in mind is that Halloween is also a Fall celebration. Pumpkins, orange, brown and fall colors also work for Halloween. I run several Halloween costume sites and I can tell you that the majority of costumes are not of the gory, spooky kind but more about the latest movie characters and dressing up as Robin Hood or Alice in Wonderland so Halloween is not always associated with gore anymore. I think its a great idea. I love Halloween, if you are throwing a Halloween themed baby shower party you can have so much fun with the decorations, food and games. You can get so many Halloween products these days and most of them are cute and would make ideal Halloween baby shower decor. Fun spiders, addorable little ghosts, pumpkins and so on. You can make your Halloween Baby Shower Party as scary or as fun and cute as you want it to be. Infact, I have my own website in relation to baby showers and I’ve created a whole section of Halloween baby shower games and invites, I think this whole theme is great.